Although I had no idea at the time, "Dancing in the Street" was a cover of the hit song by Martha and the Vandellas which had reached #2 in the U.S. and #4 in the UK in 1964. It was penned by Motown legend Marvin Gaye, William "Mickey" Stevenson and Ivy Jo Hunter. 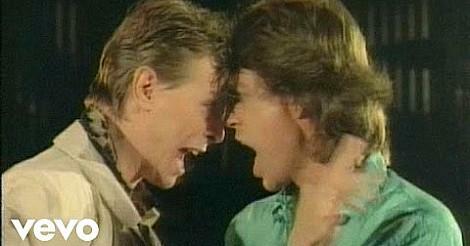 Did you know that Bowie and Jagger's version was not the first cover of the song to hit the charts in the 80s. That trophy goes to Van Halen who's quirky cover reached #38 in the U.S. in 1982. However, it wasn't a hit in the UK, and I'm not quite sure whether it was ever released over here. 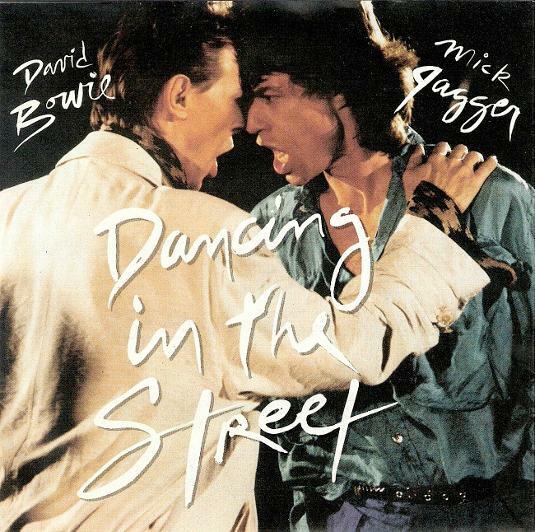 David Bowie and Mick Jagger's cover was the most successful of all the versions released in the UK, topping the UK singles chart for four weeks. In the U.S., the single reached #7. Released on the EMI record label, all proceeds went to the Live Aid famine relief cause. The single also reached #1 in Australia, Canada, Ireland and Spain. The duo had planned to perform the song live at the Live Aid concert with Bowie performing at Wembley Stadium and Jagger at the John F. Kennedy stadium. However, after discovering that the satellite link-up would cause a half second delay, the idea was abandoned, and the duo weren't prepared to mime to the backing track which was the only way to make the performance possible. The video for the song was shown instead. However, the duo did manage to perform together on stage at The Prince's Trust concert on 20th June 1986. While Bowie was recording his songs for the "Absolute Beginners" movie soundtrack album, Jagger flew in to join him at Abbey Road studios. They recorded a basic mix of "Dancing in the Street" within four hours, and the final mix and accompanying video were completed in just 13 hours. The duo performed together for the video at London Docklands with director David Mallet. The duo performed together for the video at London Docklands with director David Mallet, which was pretty much made on the fly. It's a video that has often been mocked, and one of the funniest was a stop-motion lego remake by Dangerous Minds on Vimeo which had me in stitches. The UK 7" single featured different tracks to the 12" with the 3:08 Clearmountain Mix on the A-side and a 3:17 instrumental on the B-side. The 12" featured three mixes of the A-side. The Steve Thompson and Michael Barbiero Mix (4:40), dub version (4:41) and edit (3:24). In 2013, an unauthorised biography by Christoper Anderson 'Mick: The Wild Life and Mad Genius of Jagger' made a controversial claim that Bowie and Jagger were lovers". The single spent four weeks at No.1, entering the chart at No.1 on 1st September 1985, knocking "I Got You Babe" by UB40 and Chrissie Hynde off the top spot. For the following three weeks, the single held Bonnie Tyler at No.2 with "Holding Out For A Hero". On 29th September the single slipped to No.3 allowing Midge Ure's "If I Was" to top the charts. Jennifer Rush climbed from #15 to #2 with "The Power of Love". In Canada, the single replaced "Elmo's Fire" by John Parr at the top of the charts on October 5th 1985. A line from the song "cause summer's here and the time is right for fighting in the street, man" had already been used by Jagger for The Rolling Stones single "Street Fighting Man" in 1968.